My personal chef, who happens to be my son (haha! ), cooks a perfect steak. However, he was busy with his school tests today which meant that I was forced to cook the “perfect” ribeye steak instead. Fortunately, I have assisted him in the past. As a mum, I’ve had more than 10,000 hours of cooking practice so I should be a good cook (according to the book, The Outliers.) This should not be much of a challenge but I was seriously panicking as I didn’t how these steaks will turn out. 1. Rinse the steak(s) and pat dry. 2. 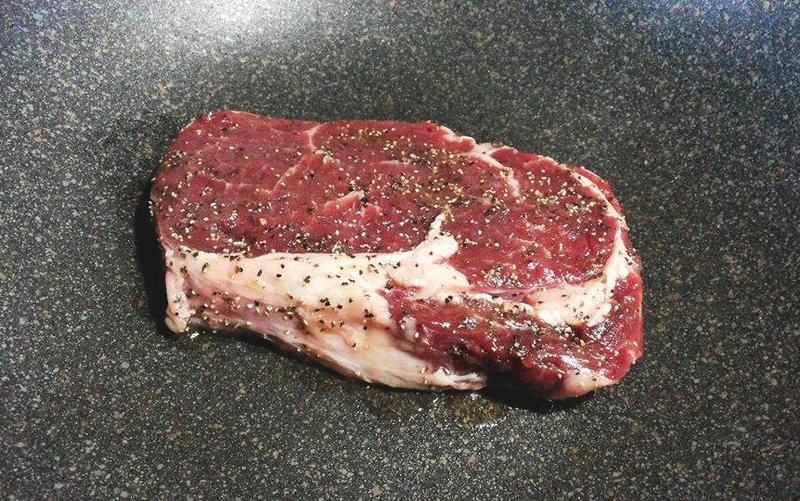 Rub the sea salt into the steak, then the pepper, and lastly the olive, on both sides of the steak. 3. Leave it for about an hour to soak in the flavour (or you can cook immediately). 1. 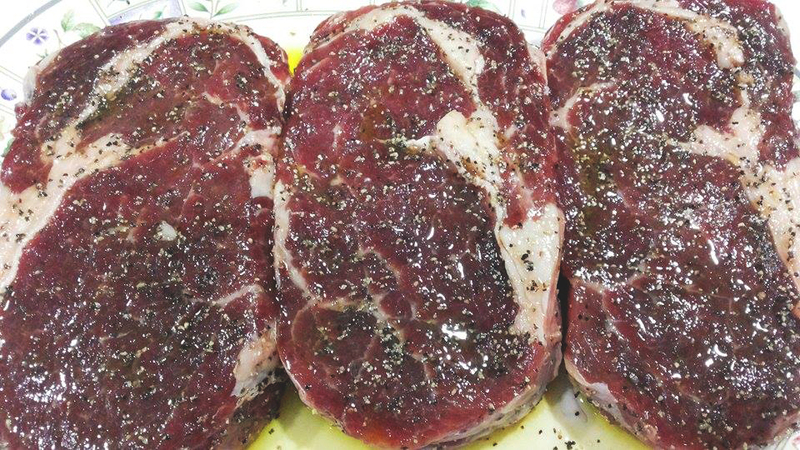 Make sure that the seasoned steak(s) are at room temperature before cooking so that the steak is not cold in the middle. 2. Heat up the frying pan on moderate heat. Make sure the pan is nice and hot. 3. Put your steak into the pan and gently pat it down with your tongs so that the meat touches the pan. 4. Cook for 1 ½ minutes on each side. 5. Quickly sear all the sides of the steak to ensure that the fats are nicely caramelised. 6. 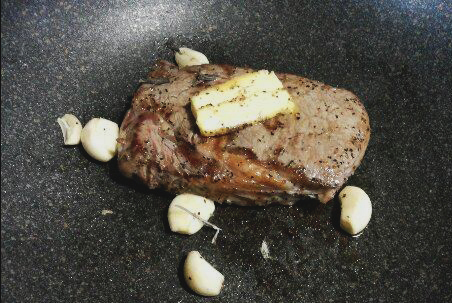 Turn the steak, take the garlic and rub on the top of the hot steak then tap the rosemary and the butter to give the flavour to the steak. 7. Turn the steak to the other side and repeat. 8. Take your steak out from the pan and pour the juices from the pan onto the steak. Let it rest for about 3 to 4 minutes. 9. Plate your steak and pour the resting juices onto your steak. You may serve with sautéed vegetables. TIP: Medium steak is cooked for a total of about 2 ½ minutes on each side. If you want to have it medium rare you can reduce the cooking time to about 2 minutes on each side. Looks delicious! 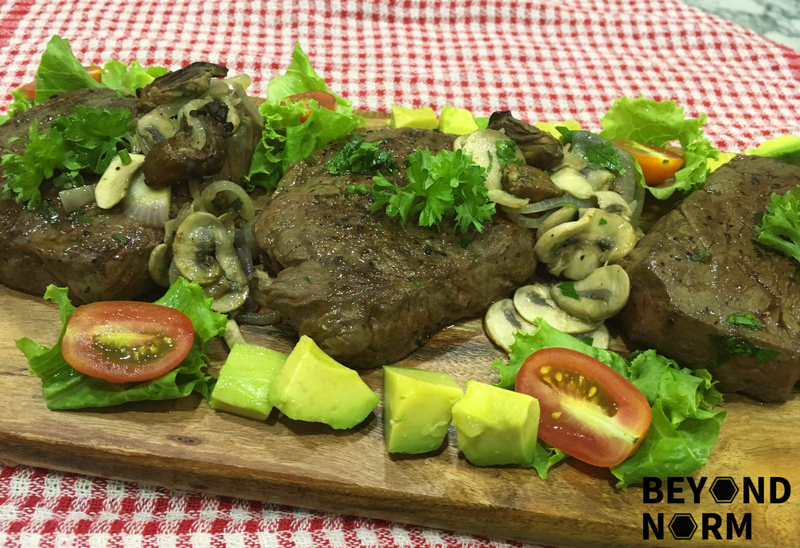 Have you tried Leeuwin Grass Fed beef? It’s the best steak I have ever had!!! Si amazing!